I head the Brighton Alexander Technique College and have taught the Alexander Technique for over 30 years I am proud to have been trained by Dilys and Walter Carrington. I worked intensively with Dilys after qualification and I can help you regain a sense of balance in your body and in your life. The Alexander Technique is a unique form of personal neuromuscular re-education. It’s making the best use of yourself through a practical method of self observation and improvement. I am co-presenting the STAT annual memorial lecture this year. (Sat 29th June 2019) Talking about Hyper-mobility and how the Alexander Technique can help. 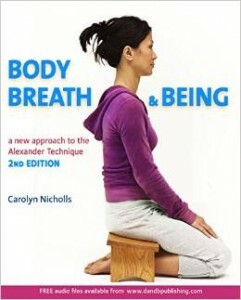 Body, Breath and Being 2nd edition is available NOW! I'm working on an audiobook of Body, Breath & Being- a new guide to the Alexander Technique. You can download an mp3 file of a semi-supine talk though here. Find out how the Alexander Technique can help you to: Improve your wellbeing and your posture. Manage back pain. Cope with stress, enhance speech and confidence for everyday life or performance.